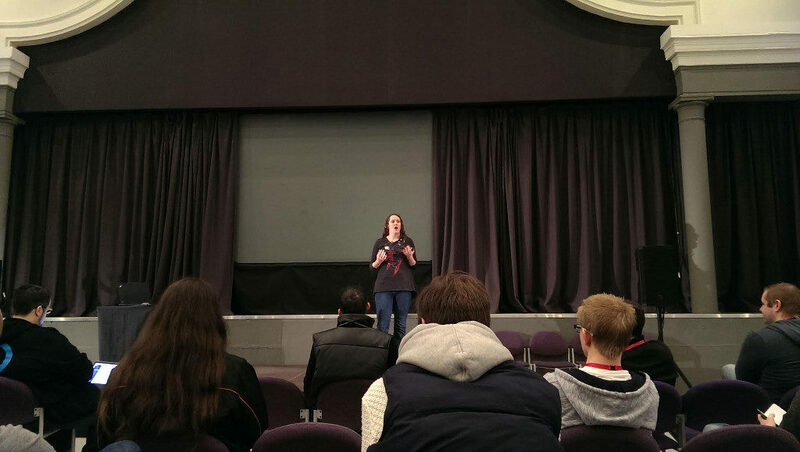 Last weekend, WordCamp London 2015 took place in the London Metropolitan University. It was a three day event with a contributor day on the Friday, and WordCamp over the Saturday and Sunday. This was a top notch event, with some great learning and takeaways across all three tracks. The after party as well was great fun, the food was incredible (seriously, some of the nicest bread rolls and pies I’ve ever eaten) and I got to meet some of my WordPress friends from all over the UK and the world. 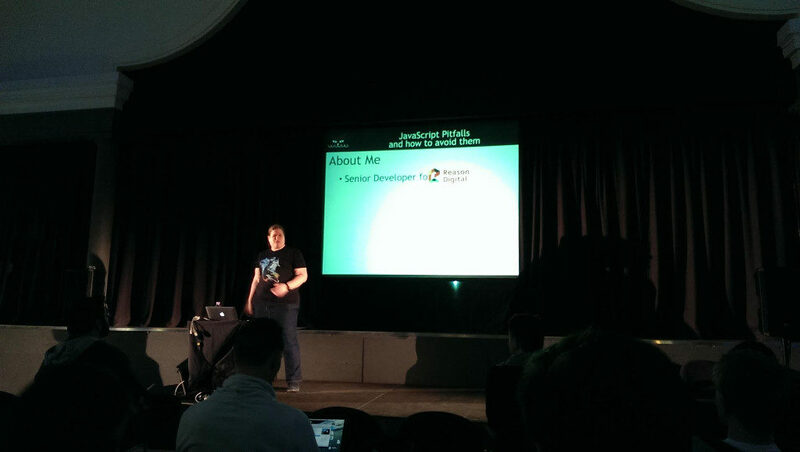 I decided (similarly to WordCamp Europe 2014), to write a recap post. Although I didn’t go to all talks (there were rugby matches on at the time), I did try to go to some, and here are my notes from the event. It should be briefly said that these are my notes, and my interpretations of what the speakers said. If anything is incorrect, please let me know! 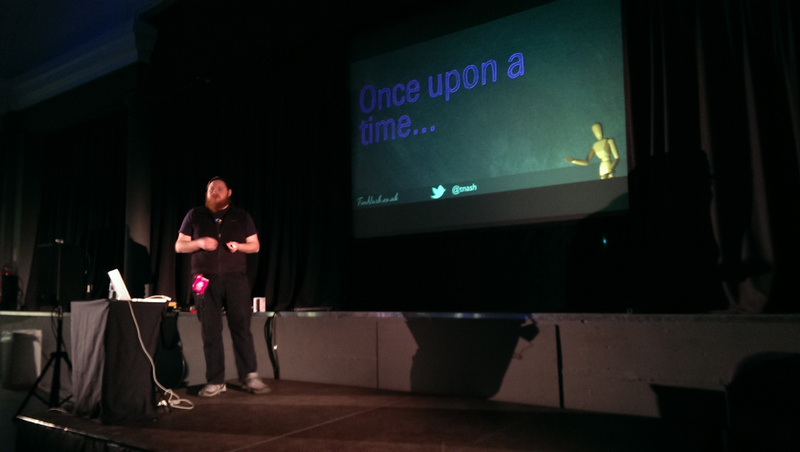 So without further ado, here’s our WordCamp London 2015 roundup! Sam’s talk covered the basics of unique theme development and why you should do it. The talk covered why you should do it from the ground up to avoid security and accessibility issues, and what you need to know if you want to build a theme. The talk was great as it covered in such a short amount of time how to build a theme from the beginning, and full of information in how to build a theme for the ground up. It covered some shortcuts on how to build your own starter theme, that you know and you trust. Start with a clean slate with your unique theme, but don’t reinvent the wheel. Put your name in your theme header if you work for an agency, so you know who builds it. Think of pages that are missed, such as 404, search results and archive pages and styles created by the WYSIWYG. 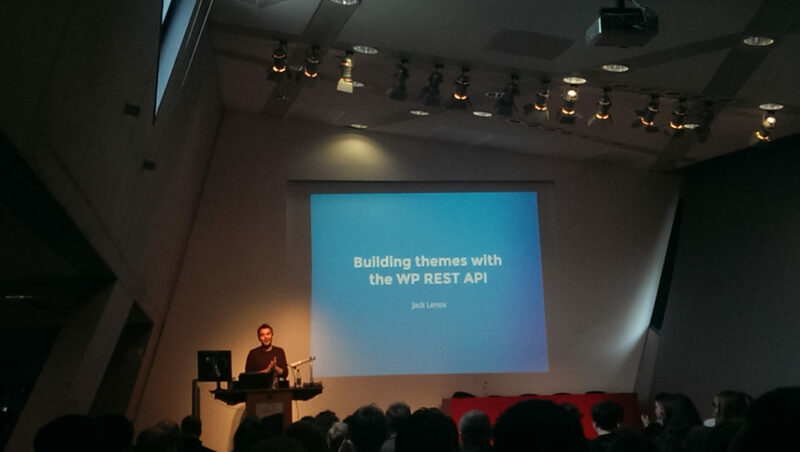 Jack Lenox’s talk was a very quick introduction to the WP REST API, what it is, and where it is used, and why you should use it. It was a very complex presentation, but absolutely fascinating. Jack did also eat his own dog food – the presentation was written in the WP REST API, and is hosted on Github (though I couldn’t find it when I checked Jack’s Github Profile, so try to find it there). The REST API does seem to be the future of WordPress, so it’s well worth checking out his presentation on WordPress TV when it’s live. With a Single Page Application effectively you have one page load, and load data into that page. It’s not all or nothing. WordPress themes and plugins have steadily been doing more and more. Heather’s talk I was looking forward to as it’s become something I’ve focussed on this year with my Easy Digital Downloads – Taxamo Integration plugin. 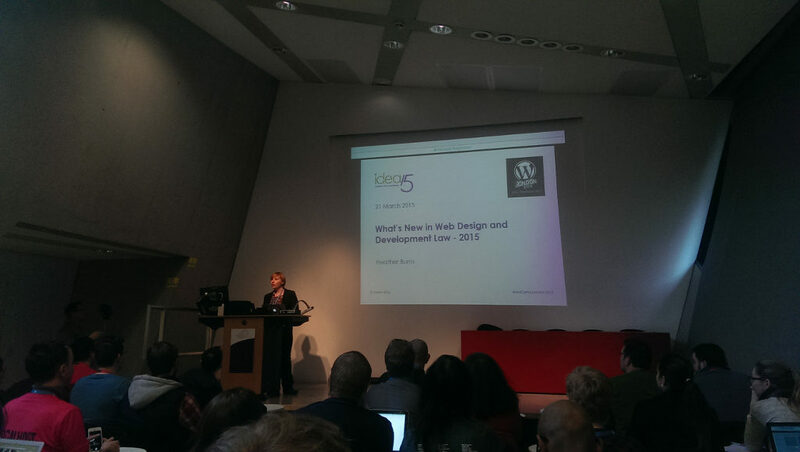 The talk focussed on the big laws that could affect web developers. The laws that are affected are the UK Consumer Rights Bill and the EU Consumer Rights Directive, to associate with the buying and selling of services, the changes of the Copyright Law in the UK (a recommended pluign is the Credit Tracker Plugin), and of course VATMOSS. Whilst not a lawyer, there were a lot of information. You should check out information on VATMOSS at http://euvataction.org/. The EU Cookie Law has cost $2.3 billion per year, and has had 3 fines in total. Good Intensions are Useless in the Absence of Common Sense. Imagine what we can achieve if we actually group together and Professionalise. The first talk of the afternoon was Helen Hou-Sandí talking about User Approach to Meta Fields. As WordPress is a collection of forms, then all data inputted is fields. 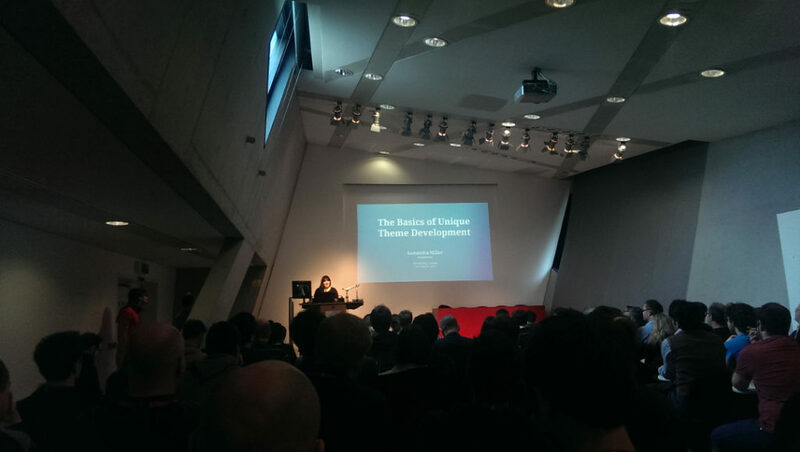 Helen’s talk focussed on how API’s and developers can develop systems that give users a good user experience. Keep your User Experience simple, and within line to standard user experience. Security is a user experience. Bad security can lead to a bad user experience. Bad data inputs from users should be protected, rather than punished. 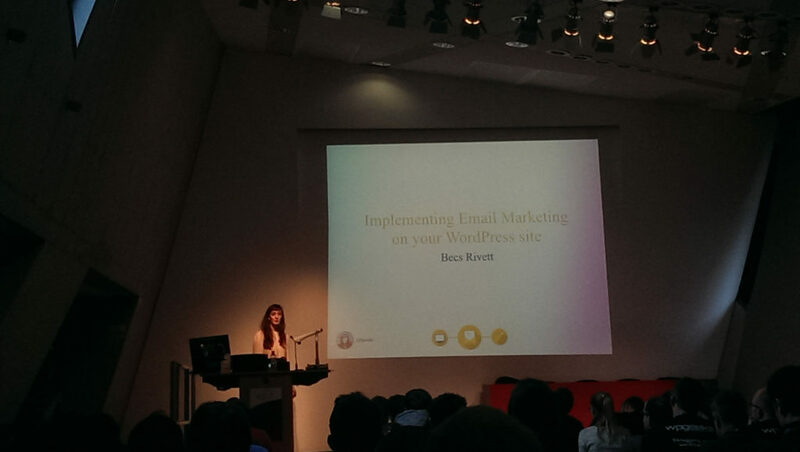 Becs’ talk centred around Email Marketing for WordPress. As the publisher of WP Email Capture, I made sure a caught her talk, as well as a newsletter provider. 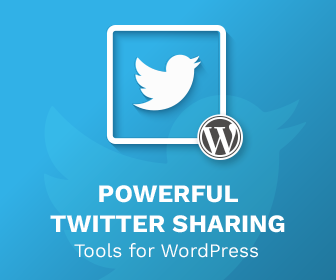 She shared a few plugins to use to manage your email list in WordPress before changing to email marketing tips, as to how to get signups, how to convert and what to send. For every $1 spent on email marketing, $43 is returned (Adsense is $22). Give people a reason to sign up. What’s your hook? Tell them what to expect. Hold back some unique content, use that as a reason for users to sign up to your newsletter. The bind function has been deprecated, use helper functions, or better use .on. Lorna’s talk came from a more generic PHP community, rather than from WordPress. As it stands, WordPress runs on 5.2, so this talk focussed on possible changes you need to bear in mind should PHP on your server be 5.3 and above, as well as new shiny things included. You can check this using the PHPCompatability PHPCodesnifer Standard. Namespaces are included in PHP 5.3, allowing pick-and-mix other people’s code. A lot of nonsense was removed from 5.4, such as long arrays, magic_quotes and y2k_compliance. PHP 5.4 refuses to guess the timezone and will warn you, and use continent place (rather than offset). Mark’s talk focussed on caching, and when and where you can do and should do it. It gave advice on plugin and theme developers on whether to use the transient or the object cache API, and how to use plugins and drop-ins, along with server setup. Mark also shared Cache Buddy, a plugin to help caching, as well as Fragment Caching in WordPress. If you’re fetching small amounts of remote data, use Transients. For large amount of local data, use the Object Cache API. Cache the whole page for as many page users for as long as it’s viable. Cache expensive, reusable HTML elements, such as headers and footers. Tim’s talk was about testing code using Acceptance Testing. Acceptance Testing is a form of testing which is not done in isolation. Although it is slow, it can help you find out issues in your code. Tim recommends Codeception along with the WP-Browser addon to handle BDD based Acceptance testing in WordPress. Acceptance Testing is codebase independent, and breaks things like a client. If tests are erorring, something has gone fundamentally and horribly wrong. Testing is not just for development, can also be used to automate test backups, for example. 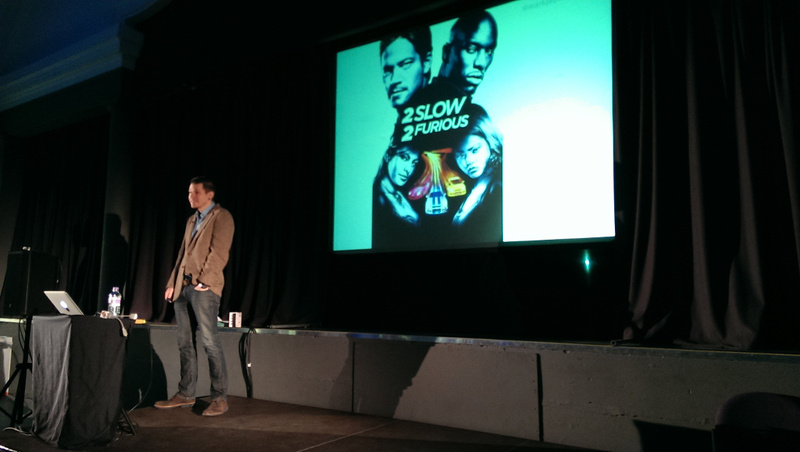 So those are my notes, a big thank you to all the speakers, volunteers and sponsors who helped make a great weekend. 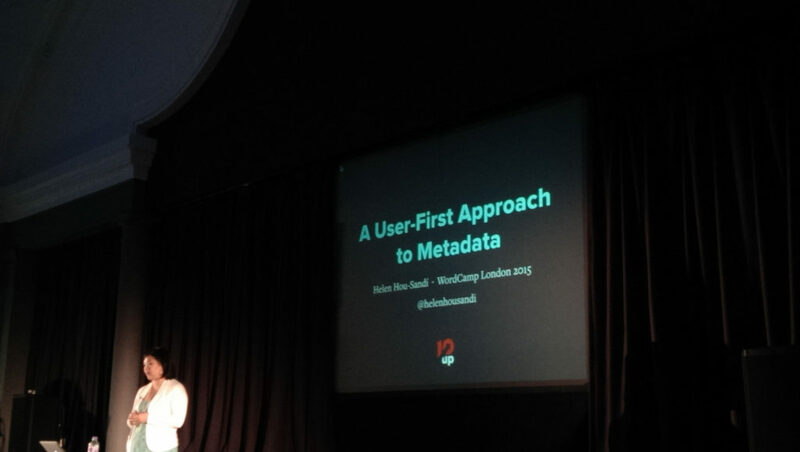 But what did you think of WordCamp London 2015? Did you go? Let me know in the comments!